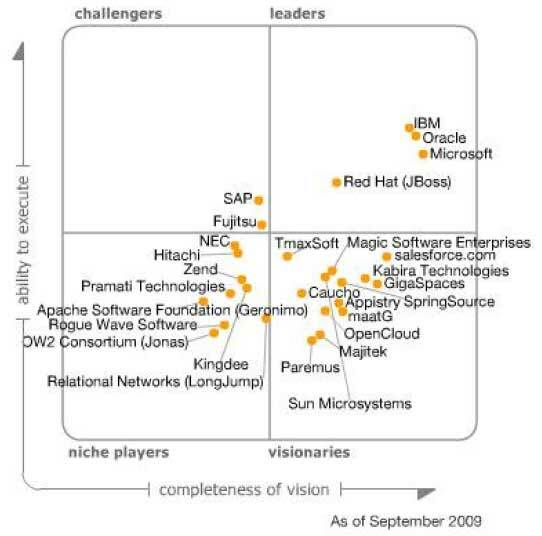 Gartner takes a look at the current application server landscape and places Oracle in the "Leaders" quadrant. Compared to former MQs this is a slightly worser performance for Oracle/BEA at all. In the circumstances of continuing consolidation of the market [...] and the simultaneous pressures of the economic recession [...] the leaders in this market have notably separated from the rest of the competitors. Oracle's EAS offering includes the strategic Oracle WebLogic Server (WLS) family of Java EE 5-compliant products, deriving from the 2008 acquisition of BEA Systems and the internally developed J2EE 1.4-compliant Oracle Application Server (still supported but not strategically promoted anymore). The WLS product line includes WLS Standard Edition, WLS Enterprise Edition and the WebLogic Suite, which bundles extra capabilities like the Oracle Coherence distributed caching platform, extended management capabilities, WebLogic Real Time (an enhanced version of Oracle's JRockit JVM) and WebLogic Operations Control for application virtualization. Other products that play an integral part in Oracle's EAS offering include the Oracle JDeveloper integrated development environment (IDE), the Oracle TopLink object/relational mapping tool and Oracle Enterprise Manager for advanced monitoring, administration and management. The popular Oracle Application Server is supported for maintenance purposes, but Oracle doesn't plan for major evolutions and actively encourages users to replace it with the strategic WLS product, by means of specific migration tools. If completed, the anticipated acquisition of Sun (still pending due to certain conditions, including clearance from the European Union at the time of publication of this Magic Quadrant) will further extend Oracle's portfolio of EAS-related technologies. In particular, crucial for the future of the Java-based EAS market will be Oracle's strategy about Java technology and the Java Community Process, of which the company will gain ownership and control. Oracle's strategy about Sun's open-source GlassFish application server, which Oracle will probably position as the entry level of its EAS family of technologies, will also have a strategic relevance from an industry perspective by being the product reference implementation of the Java EE standard. WLS is a comprehensive EAS offering sitting at the foundation of Oracle Fusion Middleware (OFM) — Oracle's strategic application infrastructure stack — and Oracle's packaged application business products. WLS is primarily focused on enabling business-critical applications, but is able to support a wide range of user requirements, from small to midsize business-oriented packages to advanced XTP-style applications via Oracle Coherence, one of the leading products in its category. BEA Systems was able to build, since 1998, a market share coleadership that was maintained for many years and that has generated a wide and loyal installed base (in the order of many tens of thousands of deployed instances of WLS products), a large industry following and massive third-party support. This adds to the notable Oracle Application Server customer base accumulated by Oracle since its entry in the market in 2001. WLS is a widely proven, state-of-the-art, Java EE 5-compliant and OSGi-enabled product that is supported by a visionary road map covering compliance with the future Java EE 6 and dynamic "SOA inside" modular architecture, support for multiple programming models (e.g., SCA, OSGi/Spring, Scala), massive scale-out capabilities and autonomic/rule-based management, specialized event-processing server technology, support for XTP architectures, and extensive use of metadata and virtualization/cloud capabilities. Both WLS and Oracle Application Server are frequently used to support opportunistically oriented products. However, pending the Sun GlassFish integration in the offering, Oracle doesn't yet have specific EAS products focused on addressing the fast-productivity, low-cost requirements of mass-market developers, nor does it support Web 2.0-style or opportunistically oriented application projects. The demotion of Oracle Application Server to a nonstrategic role creates opportunities for both closed-source and open-source Java EE vendors. Should the transition to WLS prove too expensive or too difficult or undesirable for other technical or commercial factors, competitors may be able to attract Oracle Application Server customers (especially those not locked into Oracle via packaged applications or other OFM layers). Despite Oracle's track record in managing acquisitions, the many potential challenges of the forthcoming acquisition of Sun may distract Oracle's management or slow down the company's EAS plans, and may create new business and technical discontinuities. Sun's core EAS is its open-source GlassFish Java EE 5 Application Server. A Java EE 6 preview is also available in GlassFish Application Server v.3 Preview. The technology is the Java EE reference implementation and is available for free download from Sun. The road map for all offered products is subject to review after Oracle's acquisition of Sun. This biggest strength from Gartners point of view ist the industry leadership in defining Java and Java EE standards. It injects Sun into all Java-related industry initiatives, while a strategic all-company commitment to the open-source software distribution model differentiates Sun from most Java competitors. One of the Cautions for Sun Microsystems states, that the pending acquisition by Oracle deters many prospects from committing to Sun software offerings. 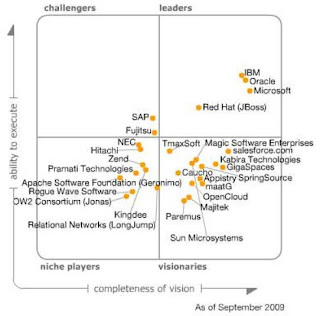 Read the full MQ at Gartner.